As Philippines embarks on its Digital Transformation journey, the first Philippine OpenGov Leadership Forum was held in Manila on March 9, 2017, bringing together senior ICT executives leading the change process in their respective departments across government. Mohit Sagar, Editor-in-chief of OpenGov Asia kickstarted proceedings talking about the power of ‘We’ and driving change through collaboration. Mr. Sagar cautioned the audience not to get stuck in the journey and the process, but to focus on the outcome. The process will define itself once you know what you are looking for. The challenge is that often we do not know what we are looking for. He also spoke about the power and wisdom of crowds, giving the examples of sharing economy companies such as Airbnb and Uber. But organisations continue to think and work in silos, with people trying to change the world on their own or getting too comfortable with the way things have always been. So, how do we rethink what we think? The answer might be to create pockets of experimentation within the organisation. Gradually, experimentation becomes intentional, initiatives become bolder, and change agents seek executive support for new resources and technology. Individual groups recognise the strength in collaboration as their research, work, and shared insights contribute to new strategic roadmaps. A dedicated digital transformation team forms to guide strategy and operations based on business and customer-centric goals. Finally, digital transformation becomes a way of business as executives and strategists recognise that change is constant. A new ecosystem is established to identify and act upon technology and market trends in pilot and, eventually, at scale. The opening was followed by a keynote address from Denis F. Villorente, Undersecretary for Innovation and Development at the Department of Information and Communications Technology (DICT). He talked about how the youngest agency of the executive branch of the Philippine government is working together with different government agencies and departments to ensure universal access to quality, affordable, reliable and secure ICT services. Undersecretary Villorente said that following the President&apos;s approval last week, a clear mandate has been obtained for the entire government to rally and create the necessary backend to provide integrated transactional services on the National Government Portal. Addressing the delegates,Undersecretary Villorente said, “In order to do this, we have to do at least two things, create appropriate technology for government-to-government, government-to-citizen, government to business and secondly, ensure that this technology is accessible to all citizens. The huge challenge we face is knowing which technology is suitable for which demographic and what to prioritise. And this we have to do together with you.” Open government defined as the intersection of accountable public officials, transparent government, and participative civil society, will play a critical role in this process. Undersecretary Villorente went to talk about some of the key projects being driven by DICT to create an open government providing relevant and useful services to citizens. First is the E-Government Master Plan (EGMP), the roadmap to create an efficient, technology-driven government. A successful EGMP will enable the availability of efficient services for all Filipinos, a government that talks to and collaborates within itself and a healthy environment for businesses to succeed. Within the EGMP there are a number of projects and Undersecretary Villorente talked about four of them: National Broadband Plan (NBP), Free public Wi-Fi, the National Government Portal and Tech4ED. 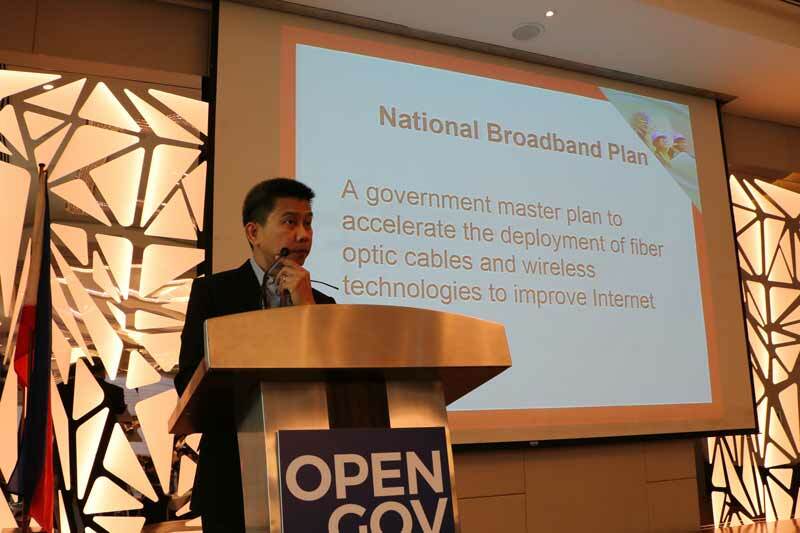 The NBP is the government’s master plan to accelerate the deployment of fibre optic cables and wireless technologies to improve Internet speed, reduce the cost and make it more affordable and ensure access even to those areas that are not attractive for private telecom companies to deploy services to. The NBP highlights importance of access to information as a building block for economic growth. Efficient allocation and management of assets, and reform of existing laws, policies and standards to maximise benefits of broadband in all sectors of the nation. Priority is given to the last mile connectivity. He also set the record straight on recent news reports about Presidential approval of the NBP. It was misreported that the NBP had been approved by the President (OpenGov has updated its report here). The NBP has not been finalised yet. DICT was seeking the President’s approval for conducting a more detailed study on Option 2, among three options presented. This Option 2 involves government investment in broadband infrastructure. In the past the Philippine government has relied private telcos to invest in broadband, which has led to the country lagging behind peers in the region. DICT obtained the requested approval and posted a working draft of the NBP inviting comments and inputs from all stakeholders. This is an “Internet for All” project that will provide internet connectivity in public places across the country. The free public Wi-Fi project will allow DICT to service nearly 13000 sites in all municipalities and cities of the country. Since starting last year, there are 250 sites installed (including national government agencies, local government units, public schools, rural health units, public libraries, public plazas and parks) serving 220,000 public devices with 25000 users daily on these sites. The National Government Portal is meant to be the government’s online, frontline desk. Its objective is to provide one-stop service, uniting all online government information and data, as well as providing a single platform for citizens to access government online services. The third aspect of this is to be able to provide the facility to submit petitions to government or to provide feedback. Undersecretary Villorente also outlined how those citizens who are not comfortable accessing the internet would also be able to access government services more easily, closer to their residence. This could be accomplished by enabling the portal services at say post-offices. Government agents working out of the offices could help those citizens to transact with the government through the portal. DICT is focusing on ten areas of priority e-services, drawn from discussions across government, Basics (such as birth to death certificates), Gov ID application), voting services, taxation, education & scholarship, civil services, businesses registration, investing, housing, citizenship & immigration and services for OFWs (Overseas Filippino Workers). DICT is also working on improving access to public data and information, as part of the Freedom of information and Open data effort. Tech4ED or the Technology for Education, Employment, Entrepreneurs, and Economic Development Project aims to provide efficient delivery of government and other services, as well as a tool for employment and participation of underserved as well as unserved communities in development. The services on the platform are categorised into: eEduskills, which provides non-formal education and skills training through e-Learning on demand, eAssist which provides learning and continuous skills development opportunities for digital inclusion for special sectors such as women, People With Disabilities, senior citizens, Overseas Filipino Workers including their families and relatives, Career shifters, and teachers, eAgri for advanced farming technology for farmers and fishermen, eMarketPlace, which provides greater market reach beyond the entrepreneurs’ community and eGovServ which provides a more convenient, direct access to various government services in rural communities. He urged the government agencies to engage with DICT, “Reach out to us, talk to us. We will keep our doors open. And we wish for a healthy engagement with everyone. Know that we value your partnerships and insights, now more than ever."